If you’re a business professional who frequently goes on short business trips, you’ll often have to take a briefcase as well as a backpack or a small suitcase with you. 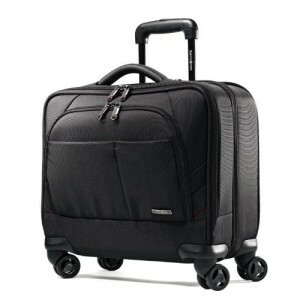 The Samsonite Luggage Xenon 2 Spinner helps to solve this problem by acting as an all in one solution as it is ideal for short overnight business trips as it is designed to be used as a carry-on on flights, has lots of compartments including one for clothing and has 4 multi-directional spinner wheels. Business professionals or regular luggage buyers will have heard of the Samsonite brand and will know that the brand is associated with quality and style. In this review, I will go through each feature of this briefcase and explain how beneficial it will be to today’s modern traveling businessman. Four Multi-Directional Spinner Wheels: Allows you to easily push your briefcase along upright in any direction for easy mobility. Storage: There are lots of compartments and pockets that are separated for you to store files/folders, laptop, stationery and for overnight clothing. Padded Laptop Compartment: Along with the sewn in Velcro strap, this will protect and secure your laptop in place. Can Be Used As A Carry-On: Its ideal for overnight trips as its size makes it perfect to fit under your seat or in the overhead carrier. Lockable: Each compartment has zip closures which also allows for the use of a padlock to secure your belongings. Limited Space For Clothing: The compartment for this is very limited so you can only fit in pyjamas and underwear or an outfit made of light fabric for the next day. Cannot Be Overloaded: If you attempt to overfill the briefcase, it will be hard to zip up the compartments. Fits Laptop Screen Size Up to 16"
The Samsonite Luggage Xenon 2 Spinner briefcase has a professional and sleek feel and look with its classic and simple design. It is made from a durable polyester fabric with hidden stitching and thick fabric piping along the edges on each big compartment and on the back of the briefcase. The size is perfect to be used as a carry-on on flights as well. Each compartment is made with a zipper closure and the zips are coated in a matt black rubber sleeve with a red line design across the end. As there are large holes at the end of each zip, this will allow you to lock your briefcase. A retractable carry handle is fitted with metal pins on the top of the middle section of the briefcase which is made of the same durable polyester fabric wrapped around thick padding. Sturdy telescopic handle and 8 (2 on each corner) directional multi-spinner wheels. For easy mobility, this rolling briefcase is fitted with 4 multi-directional wheels. On each wheel port, there are actually 2 slim wheels so really, there are actually 8. 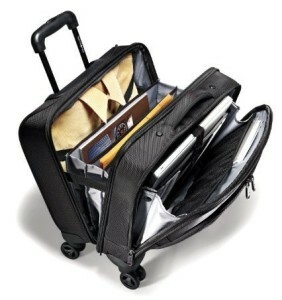 These wheels will allow you to roll the briefcase upright in any direction. Unfortunately, a few consumers have found that the wheels tend to wear out quite fast when using it on a daily basis but there is a 3 year guarantee on the briefcase so if the wheels were to break, this would be covered. On the back of the briefcase is where you will find the adjustable pull up handle to roll your briefcase along. It will lock to any of the 3 lengths with the push lock button on top of the handle. Just below the handle, there is a thick and durable strap sewn across the width of the briefcase. This allows you to slip this onto other suitcases with upright handles for better mobility. This briefcase can be used by the carry handle, by pushing or pulling it along on the 4 wheels or by attaching it onto a suitcase with upright handles. Insert for a telescopic handle at the rear for convenience. Consumers using the carry handle have found it comfortable due to the padding but the fabric would rub roughly against their hand. However, the briefcase cannot be overly full otherwise it becomes too heavy and it can cause the handle to snap off as one consumer discovered. As there are no heavy materials used in the design of the Xenon 2 Spinner, this makes the briefcase relatively light at its base weight of 9lbs. So carrying it by the handle wouldn’t be too heavy provided that it is not overfilled. With the upright handles and the 4 spinner wheels, this makes it easier for people to carry their laptop and documents with them. The wheels are very sturdy and they roll in any direction smoothly even when it is heavy. Luckily, if your briefcase becomes a bit too bulky, it will not cause your briefcase to topple over. Consumers are relieved this does not happen as this is often the case with 2 wheeled briefcases. 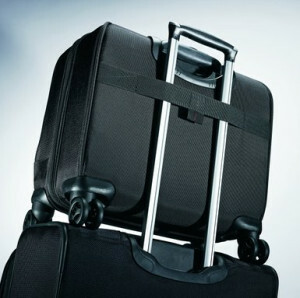 In the Samsonite Luggage Xenon 2 Spinner, there is one main compartment, one laptop compartment and a large zipped pocket with 2 stitched pockets sewn on the front of the briefcase. One of the stitched pockets is smaller to hold your mobile phone in and the other pocket is wider with a concealed zip which is ideal for a wallet. At the front of the briefcase is the laptop compartment. It zips open almost to the bottom of the briefcase and the sides are held by two pieces of fabric to prevent anything falling out. 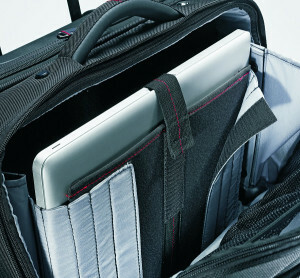 It has a padded pocket to protect your laptop which can be adjusted with the velcro to the size of your laptop. A velcro strap is sewn above the pocket to ensure your laptop stays in place. There are also 2 mesh pockets inside. Although the laptop compartment is designed to fit laptops up to 15.6 inches, consumers with 17 inch laptops have been able to fit this in. However, the laptop will need to be of a slim design otherwise it will not fit in the padded pocket. In the main compartment at the back, is where you will find 3 concertina slots for your paperwork, files, notebooks or magazines. The zips will open all the way round to the back of the briefcase. Against the back of this compartment with the hard backing is where you will be able to store a few overnight clothing items which can be held in place with straps. 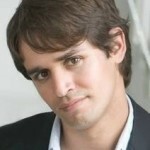 Consumers have found that attempting to fit anything in thicker than 3 inches will be quite difficult to zip up. So if you’re fitting a ringbinder filled to the brim with paperwork in the notebook slot, then chances are you won’t be able to fit anything else in there. However, one user managed to fit in a half filled ringbinder, 15.6 inch laptop with charging cables, a hardback A4 notebook, some pens, underwear and a t-shirt and was able to zip it up but it was quite bulky. In the large zipped pocket at the front of the briefcase is where you will find many different sized pockets and sleeves to hold your stationery in place. There is even a pocket for your iPad/tablet. This has proved useful for many consumers as it saves them having to carry around a pencil case or rooting around their briefcase for a pen or highlighter. Here’s a short video demo by Zappos showing what’s inside each compartment. Although the briefcase is designed to be used as a carry-on for air flights for businessmen going on short overnight business trips, it is also suitable for a variety of consumers including students, computer technicians, salesmen and anyone who often carries a laptop around with notebooks, books or files. For the price this briefcase is going at, it is very good value for money as consumers have claimed. There are other briefcases out there with spinner wheels but consumers that have through a few before getting the Samsonite Luggage Xenon 2 Spinner, have found that other ones are not as sturdy or as durable as this one. Some were too heavy, wheels broke off on some after a few uses and some didn’t have enough compartments. The best part about it as well is that you won’t end up with an aching tired arm after using it thanks to the spinner wheels on it. So whether you’re a traveling businessman or just someone who carries a laptop with lots of other stuff, then this briefcase will make things easier for you as you can just wheel your belongings around with you instead. Click Here To Buy The Samsonite Xenon 2 Spinner Rolling Briefcase Now!